This is a simplified version of the Howto:Announcement Before Answering utility. This version is based on an XML script that plays the announcement. As opposed to the other version, it will first play the announcement and then connect to the called party. The called party is not called simultaneously to playing the announcement. It is simpler in so far as it does not require to create a separate PBX object for each called party using this service. V10 SR10 PBX and later. 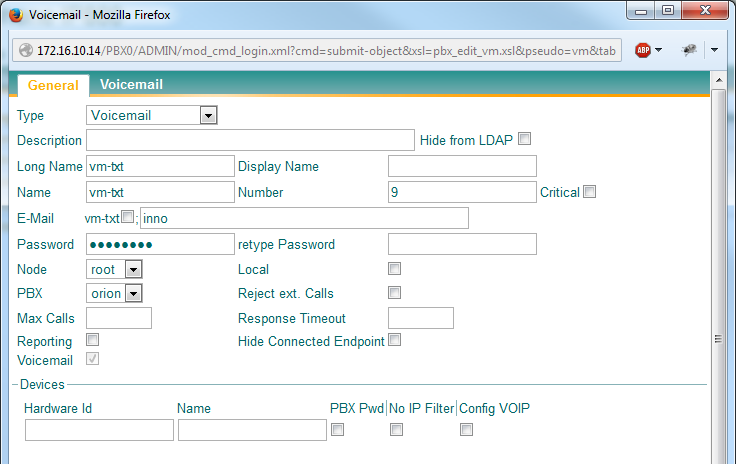 This announcement before answering configuration is based on the Voicemail PBX object. The Waiting Queue has a personal announcement configured separately for each PBX User object. We assume an existing PBX user with the name PBX User 1 and number 201 with following desired behaviour: an external call to this user is always immediately connected to the announcement. The announcement is played and when it is finished, the caller is put through to the extension. Create a Voicemail vm-txt. Configure the Script URL as http://x.x.x.x/drive/CF0/txtvormelden/announcement_before_answer.xml?$_trace=255 and the Number to 9 (check Voicemail Reference for more information). Create a so-called administrative call forward on the User object: create a CFU with Only Not. from 9 (which is the Number of the voicemail object) to the Number of the Voicemail object followed by the Number of the user (9202 in our example). This CFs can not be deleted by user configured CFs via a phone function key etc., but will be overridden by user configured CFUs (if there is one). As an alternative to the aforementioned individual CFU for each user, you can create a routing rule prefixing the voicemail object's Number (9 in our example) to the respective incoming called party number in the trunk gateway's call routing table. Please see the Download section for the most recent version of the voicemail script. The following commented version is reproduced here to demonstrate the idea, it may be outdated though. The announcement is triggered by a call forward unconditional for the respective user. If the user is busy, the announcement will be played and only then the busy situation will be detected. Same goes true for an unreachable situation (e.g. no phone registered). It might be necessary to play around with more elaborate call forwards thus (e.g. define a Busy and/or Rejected target int the Trunk object). The script supports overlapped dialling. This adds an additional 4 second delay before the announcement can be heard. If overlapped dialling is not a requirement, set the sec attribute in the <timer> tag to 0 wherever it is 4 in the original script. This page was last modified 18:13, 11 June 2014.